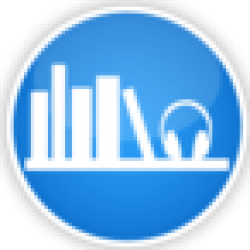 ABR's original Moon Dwellers audiobook review and many others can be found at Audiobook Reviewer. 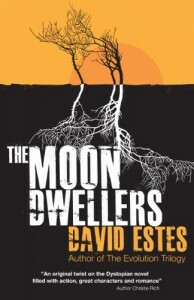 Moon Dwellers by David Estes is a young adult novel set centuries in the future after the human race has been driven below the surface of the ground. It is the first of a series of the novels called The Dweller’s Saga. Below earth, there is a physical separation of the classes with the sun dwellers being closest to the surface and having the most artificial light and the star dwellers being the furthest from the surface and having the least artificial light. The two protagonists are Adele, a moon dweller, which is the centermost realm, and Tristan who is from the sun dweller and actually the son of the President of all three realms. The novel begins with Adele and Tristan, who lock eyes and suddenly feel pain and the story that follows is both about their connection and the challenges that each of them face on their individual quests. Adele sets out to save herself and her family while Tristan tries to break the bonds that his father has around him. I really enjoyed the plot of this novel. I thought it was a nice new take on the post-apocalyptic genre. I really like the underground world idea, but when imagining the scene, I did often forget that it was all set in the relative dark. The class structure, while not a new idea in this genre, was well done in my opinion. I thought Adele and Tristan as well as all of the supporting characters were interesting and had depth as were their evolving relationships. I really liked that even some of the minor characters were interesting and had a voice – they weren’t forgettable. The biggest challenge for me was feeling like the main characters were on the verge of understanding globally what is going on, but it was just out of reach. The driving force behind the budding romance was also a little challenging for me throughout the novel. However, all of this is likely to evolve as the series progresses. The narration by Julia Whelan and Will Damron were really great. Both of them captured the main characters who they spoke for as well as their individual characters and companions as well. The production quality of the novel was good. I would recommend this novel to anyone who’s interested in young adult post-apocalyptic stories, especially ones that involve strong young women.